Merely a day after the Syrian civil war entered its fourth year the Assad regime scored a major victory against rebels in the town of Yabroud. Located in the Qalamoun region, a mountainous area near the Lebanese border, Yabroud had served as a crucial gateway for the transit of rebel supplies and fighters into the Damascus suburbs (and car bombs entering into Lebanon). The campaign to take this strategic city, which had a pre-war population of 40,000, saw regime forces backed by Iraqi militias and spearheaded by fighters from the Lebanese Shiite militia, Hezbollah, enter into the city under the cover of heavy bombardment. 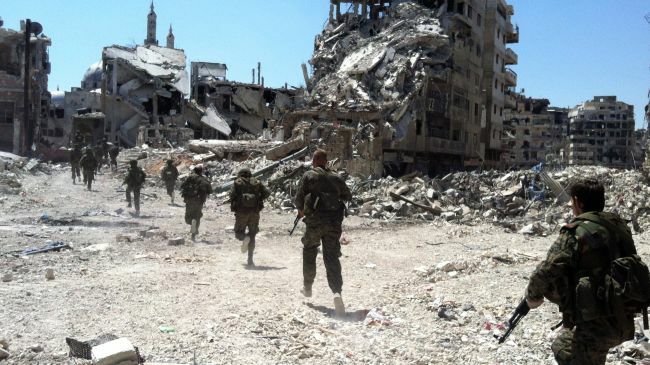 Utilizing a strategy that has come to be known as Qusayr Rules, for its development in the battle of Qusayr from April to June 2013, regime and allied forces carried out their campaign to take Yabroud in a systematic manner. Beginning in mid-February the regime captured the nearby towns of Qara, Deir Attiya and Nabak, northeast of Yabroud, before turning its focus to strategic hilltops around the rebel supply hub. Over the period of February and into March, the regime and its allies fought pitched battles in the rugged mountainous terrain, where it is reported that Hezbollah suffered the majority of its casualties. Once the mountainous areas adjacent to Yabroud were secured and rebel defenses sufficiently softened by aerial and artillery bombardment, the regime pushed into the city on Saturday. According to Elijah J. Magnier, a political risk analyst with contacts among regime forces, Hezbollah fighters approached Yabroud from the west as a diversion while regime troops entered from the east, with fire support provided to both forces. Under heavy bombardment and caught in a pincer, the rebels were forced to flee the city in haste, leaving behind the bodies of rebel fighters and weapon caches. SANA news agency, the state-owned media outlet and Hezbollah’s Al-Manar TV broadcasted images of victorious regime and militia forces in the center of the town on Sunday as part of an official announcement on the rebels’ defeat. By capturing Yabroud the regime will now be able to curtail cross-border incursions, emanating from Sunni towns in Lebanon’s adjacent Bekaa Valley, most notably Arsal. Damascus will also be in a stronger position to maintain security on the M5 highway, which connects the capital to the besieged city of Homs (itself a crucial transit route) and the coast, important both for the import of Russian weapons, food stuffs, in addition to being the homeland of Bashar al-Assad’s Alawite minority. While the victory in Yabroud marks a milestone for the regime’s campaign to secure the center of the country, allowing it to deny rebels a contiguous area between the north and south of the country and access from Lebanon, this victory in Yabroud may have significant ramifications for the security situation in Lebanon’s Bekaa Valley. In addition to retreating to the neighboring villages of Hosh Arab, Rankous and Flita to the southwest of Yabroud, many fighters fled across the border to the Sunni town of Arsal in Lebanon. While regime is now planning to mop up the rebels in these villages Arsal and the retreat of fighters into Lebanon poses another problem; one which became apparent just hours after the fall of Yabroud. Spillover has been a common occurrence in the Bekaa Valley, and Arsal has seen its fair share of aerial bombardment by the Syrian regime, both as a form of collective punishment and an attempt to pre-emptively kill rebel fighters. Sunday was no different and the town saw multiple airstrikes on its fringes, including barrel bombs, as the Syrian Air Force chased fleeing rebels across the border. While the number of rebel fighters who fled to Arsal has been estimated by the Lebanese military to be around 1,000 the true number is probably much lower. Though, these groups now pose an increased threat to the security situation in the Bekaa Valley, particularly to Hezbollah, which was formed in the region, maintains the strong support of the area’s Shiite population and in which the militia has a number of military installations utilized for training, weapons stockpiling and as a staging ground for its forays into Syria. Rebel fighters now seeking refuge in Arsal and those that have continually utilized it to carry out attacks against Hezbollah within Lebanon now find themselves in a difficult situation. Void of a base of operations directly across the border and with the regime looking to eradicate any rebel presence immediately along the Syrian side these fighters will be hard pressed to return to the conflict next door. Furthermore, it is now in Hezbollah and the Lebanese government’s interest to isolate, eradicate and detain members of these groups in Arsal and the Bekaa Valley, particularly the al-Qaeda affiliated Jabhat al-Nusra’s fighters, which have proved to be some of the most troublesome. Both trends point to the strong possibility that these remaining rebel fighters will look to target Hezbollah and its supporters within the Bekaa Valley and may act against the Lebanese army, which some Sunni supporters of the Syrian uprising have increasingly charged with aiding the Syrian regime and Hezbollah. In the immediate aftermath of the fall of Yabroud, Jabhat al-Nusra in Lebanon claimed responsibility via Twitter for a suicide car bombing that killed two Hezbollah security officials and two civilians as the former attempted to stop the bomber from exploding his payload in the middle of the Bekaa Valley village of Al-Nabi Othman. The first bombing to hit Lebanon in 22 days was accompanied by rocket attacks on other Shiite villages and a frenzied attempt by Lebanese security forces to track down and neutralize a number of other reported car bombs. The upsurge in violence in this already volatile area has already resulted in calls from Lebanese politicians for the army to secure the Lebanese-Syrian border, particularly around Arsal. In doing so the army now finds itself in a direct confrontation with rebel groups, which is has looked to avoid, given the country-wide political and sectarian ramifications of such a move. This carries the possibility of major ramifications in other areas of the country, particularly in Lebanon’s second largest city, Tripoli, where just this week fighters targeted an army convoy, killing one soldier and wounding others. This carries the possibility of major ramifications in other areas of the country, particularly in Lebanon’s second largest city, Tripoli, where just this week fighters targeted an army convoy, killing one soldier and wounding others. Lebanon now faces arguably its largest security threat since the beginning of the Syrian civil war. How the government and state security forces choose to handle the influx of Syrian rebels and the town of Arsal, among other Sunni villages, will have long term effects on the stability of Lebanon’s border regions. For Hezbollah, its crucial role in the fall of Yabrud and the escape of Syrian rebels into the Bekaa Valley ensures that attacks against the Shiite militia and its supporters will increase, further straining inter-communal relations.